319 pages | 37 B/W Illus. Respondents to survey questions involving sensitive information, such as sexual behavior, illegal drug usage, tax evasion, and income, may refuse to answer the questions or provide untruthful answers to protect their privacy. This creates a challenge in drawing valid inferences from potentially inaccurate data. Addressing this difficulty, non-randomized response approaches enable sample survey practitioners and applied statisticians to protect the privacy of respondents and properly analyze the gathered data. 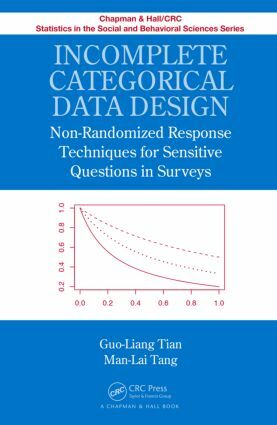 Incomplete Categorical Data Design: Non-Randomized Response Techniques for Sensitive Questions in Surveys is the first book on non-randomized response designs and statistical analysis methods. The techniques covered integrate the strengths of existing approaches, including randomized response models, incomplete categorical data design, the EM algorithm, the bootstrap method, and the data augmentation algorithm. A self-contained, systematic introduction, the book shows you how to draw valid statistical inferences from survey data with sensitive characteristics. It guides you in applying the non-randomized response approach in surveys and new non-randomized response designs. All R codes for the examples are available at www.saasweb.hku.hk/staff/gltian/. "The strong points of this text are the timing (it is the first book on its topic) and the fact that it uses both Bayesian and frequentist procedures for solving these interesting problems. The level of mathematical detail appears appropriate for Ph.D. students in statistics or related disciplines. I believe the text will be useful for self-study by scientists and statisticians, and potentially useful in some applied courses or as a supplement to a more theoretical course …"
"For all these models and generalizations thereof, a detailed discourse of hypothesis testing, estimation, large sample inference, and findings from finite sample simulation is presented. Examples accompany the discussion models and methodologies, making the book quite self-contained. The book contains, nonetheless, a comprehensive list of references in the area. … The book provides an in-depth description of all aspects surrounding inferences and analyses of the different methods to deal with sensitive survey questions. When this is added to the knowledge of conducting interviews with specific subject subgroups, one is well equipped to conduct a survey with the least possible bias." Guo-Liang Tian is an associate professor of statistics in the Department of Statistics and Actuarial Science at the University of Hong Kong. Dr. Tian has published more than 60 (bio)statistical and medical papers in international peer-reviewed journals on missing data analysis, constrained parameter models and variable selection, sample surveys with sensitive questions, and cancer clinical trial and design. He is also the co-author of two books. He received a PhD in statistics from the Institute of Applied Mathematics, Chinese Academy of Science. Man-Lai Tang is an associate professor in the Department of Mathematics at Hong Kong Baptist University. Dr. Tang is an editorial board member of Advances and Applications in Statistical Sciences and the Journal of Probability and Statistics; associate editor of Communications in Statistics-Theory and Methods and Communications in Statistics-Simulation and Computation; and editorial advisory board member of the Open Medical Informatics Journal. His research interests include exact methods for discrete data, equivalence/non-inferiority trials, and biostatistics. He received a PhD in biostatistics from UCLA.